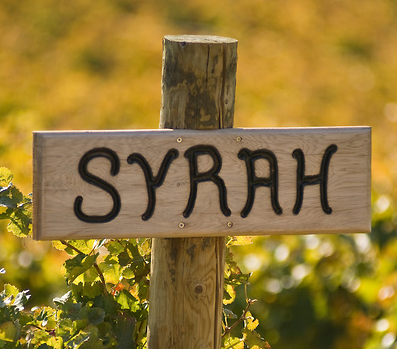 For this post, we’ve assumed that this is a “no wimpy Red wine zone.” Syrahs are usually big wines that need big flavors. Much like our Shiraz post, you’ll see lots of Syrah and beef pairing suggestions but unlike the Shiraz post, you can go with the fattier, often more tender cuts. Syrah has enough tannins to compliment them. These well marbled cuts of beef easily stand up to Syrah’s big flavors. The higher fat content makes them a tasty and tender cut of meat and Syrah’s tannins cut through that fat to create a great food and wine pairing. 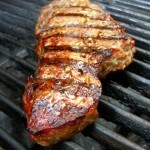 Try something like a New York Strip steak, or even a basic grilled rib eye. Both options pair very well with Syrah. At the risk of being redundant, everything mentioned above for beef goes with this simply grilled lamb recipe pairing option. If you are going to pair Syrah with Sausage, pick one that has a fair amount of beef and is smoked. 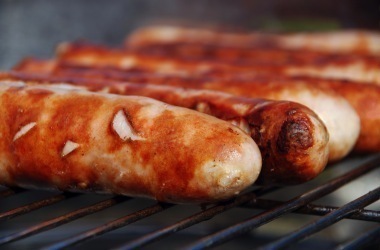 A classic German bratwurst is a perfect sausage for Syrah because of its deep earthy flavors. Avoid any lighter veal based sausages (there are a lot of veal brats so skip them). 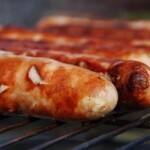 Try this grilled brat recipe but change the beer to a 50/50 Syrah and water mixture for the last simmering. See a pattern developing here with Syrah and beef recipes? Beef is a natural pairing option, and a slowly cooked, melt in your mouth kind of beef stew is always a great option with Syrah. Try this beef stew recipe in particular, if you want to give it a go. 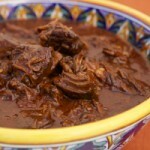 Chili Colorado is a mildly spiced Mexican stew that pairs well with Syrah. It really pairs just as well as other medium body red wines. 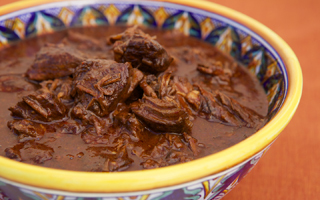 It’s unthinkable for many Mexican cooks, but if you don’t have a great source for dry New Mexico chili’s, you can often substitute in additional chili powder. Use about 4 tablespoons of chili powder. Check your cooking after about 30 minutes or so. If you think you’d like it to be just a little more flavorful, you can continue to add chili powder. Give it about another 10 minutes to cook with the additional chili powder, then try it again. Take note that adding smoked paprika imparts an additional flavor without adding heat. Like the beef stew above, this one goes equally well with Syrah. 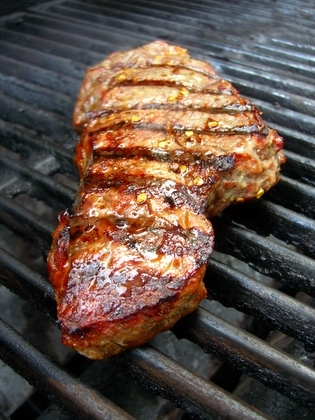 Just like our Shiraz post, we’ve leaned heavily on beef as the best food pairing for Syrah. Although not as common as lamb or beef, venison or darker wild boar meat also is great with Syrah. Syrah is not a great seafood wine. Unless you really know what your are doing (and if you do, why are you looking to this post for guidance?! ), avoid seafood with Syrah. Syrah with cheese? Probably not. The heavier flavors of the wine often overpower any of the cheese subtlety and make it a wasted pairing, both as a waste of cheese and wine! You can learn more details about Syrah like its ideal serving temperature and its ability to age by clicking here. Winery-Sage.com provides food and wine pairing advice for a number of wines. Click here to go to our general post and see what other Varietals for which we’ve suggested food pairings.